The new Eagle Scouts held a Court of Honor ceremony at the Elks Lodge in Centereach. Suffolk County Legislator Kara Hahn, new Eagle Scouts Phil Keskes and Maclaine Greisch and New York State Assemblyman Steven Englebright during the teens’ Eagle Court of Honor on Sunday, August 5, 2017. 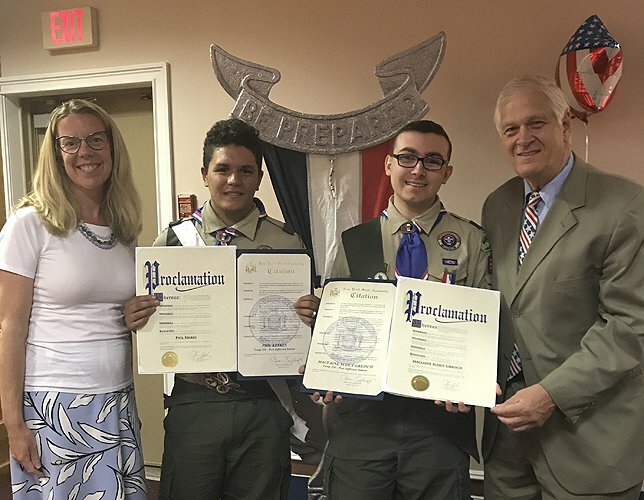 Centereach, NY - August 9, 2017 - Suffolk County Legislator Kara Hahn this week recognized Maclaine S. Greisch and Phil Keskes, both of Port Jefferson Station, on achieving the rank of Eagle Scout during their Court of Honor ceremony held at the Elks Lodge in Centereach. For his community service project, Maclaine refurbished a reading garden at the Terryville Road Elementary School which included repairing damaged benches, replacing fencing and planting new flower beds. Phil, for his project, built a set of horseshoe pits at the Benevolent and Protective Order of Elks Lodge #2138 in Centereach. Subject: LongIsland.com - Your Name sent you Article details of "Suffolk Legislator Hahn Honors Troop #354’s Newest Eagle Scouts"